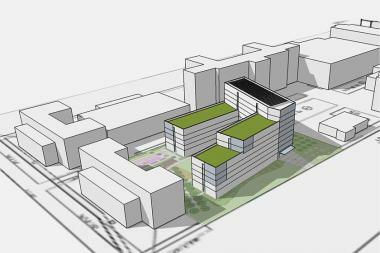 An architectural rendering of Camba Gardens II, the second phase of an affordale housing project being built on the site of disused Kings County Hospital buildings in Crown Heights. CROWN HEIGHTS — A former psychiatric ward at Kings County Hospital will soon be torn down and replaced with an affordable housing complex. Nonprofit developer CAMBA recently announced plans to demolish the Crown Heights hospital's former G-building at 560 Winthrop St. — which was a psychiatric ward until 2009 — and build a state-of-the-art apartment building in its place. The project will be the second phase of a development called CAMBA Gardens, which already occupies the site of other former hospital buildings at 690 and 738 Albany Ave.
"Growing up in this neighborhood, the biggest threat in our community was if you didn’t behave, you were going to be sent to the G-building," joked City Councilwoman Laurie Cumbo, who expressed her support for the development at Community Board 9's January meeting. Despite the site's storied past, developers said they're confident that the project will draw renters. "For the 209 units [in CAMBA Gardens I], we’ve received 7,000 applications," said CAMBA President Joanne Oplustil. "It’s the tip of the iceberg. It was astounding how many applicants came in." CAMBA Gardens II will be even larger than its neighbor, with 293 units spread across 97,000 square feet. The nonprofit has not yet announced the rents or income requirements. "For us and for CAMBA, design is a really, really important thing," explained lead architect John Woelfling of Dattner Architects. "We looked at potentially reusing this building, but the floor plan wasn’t right for adapting it. We needed to start with a clean slate and really maximize some of the advantages the site has." Developers expect the project to be completed in 2016.